PURINA Pro Plan Duo Délice Adult Rich in Salmon With Rice is a unique combination of crunchy kibbles and tender shredded pieces dogs absolutely love. With salmon as the first ingredient and the right balance of carefully selected nutrients, Duo Délice Adult Rich in Salmon With Rice contributes to your adult dog’s health and wellbeing. Salmon (17%), Wheat, Maize, Dehydrated poultry protein, Wheat gluten meal, Animal fat, Dried beet pulp, Rice (4%), Digest, Minerals, Maize grits, Propylene glycol, Dried egg, Fish oil, Malt flour. Feeding quantities required to maintain ideal body condition will vary, depending on age, activity and environment. Watch your dog's weight and adjust food amounts accordingly. Clean, fresh drinking water should always be available. For your dog’s health, consult a veterinary surgeon regularly. It is important to introduce PRO PLAN Duo Délice to your dog’s diet gradually over a period of one week. 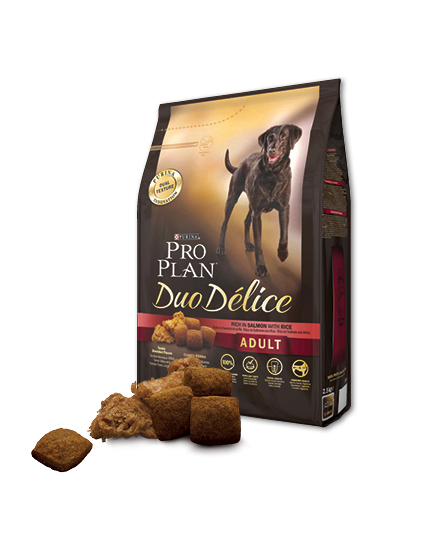 There are currently no questions for Purina Pro Plan Duo Delice Salmon With Rice Dog Food - be the first to ask one!